I've been a fan of Craghoppers classic Kiwi walking trousers for some time but have been trying out the Pro Stretch convertibles for a few weeks now. And I have to say this latest version is rapidly becoming a real favourite. They are true to size and fit exceptionally well. I'm 5'10'' and was wearing a regular length which was just right. Unfortuntately, they don't come with a belt. Whilst the elasticated waist kept the them very securely in place, I nonetheless missed a belt as I always carry a camera on one. 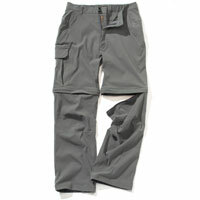 The soft feeling, stretch material plus the articulated knee design provide really great freedom of movement. There's only slight rain repellancy but the fabric dries really very quickly. The conversion to/from shorts is quick and easy - the right and left 'legs' are marked as such which does help! Sometimes when wearing 'zip-offs', I've found the zip point to be a little aggravating when in 'full-leg' mode - that does not seem to be the case with these Kiwis. My only gripe with this feature is that the finish isn't that great as there are a few loose threads appearing now. There's a good selection of zip- fastened pockets: two nice deep ones at the front on which the zip (thankfully) runs bottom-up, a shallower one at back plus one popper-fastened cargo pocket on the front right leg. There doesn't appear to be any re-enforcement on the seat or knees and I have begun to notice some slight signs of 'bobble' in some areas. If you do a lot of scrambling you'll need trousers using sturdier fabric. However for more general walking in Spring, Summer or even warmer Autumn days - Craghoppers Kiwi Pro Stretch convertibles are a great option.